Normally I am one of the first to try a technology. There have been a few exceptions over the years, but, overall, I am more than happy to jump in and experience something new. In the old days (before 2012), I used to go to the gas station, or AAA, and buy maps of the areas I expected to go to, or visit. Unfortunately, I invariably needed another map (for example: Modesto when I already had Tracy and Stockton), so off I go to the gas station, or AAA, to buy a Modesto map. 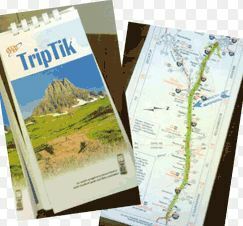 If we went on a long trip, Lori and I would visit the local AAA and get a TripTik (after spending an hour or so with a AAA Trip Advisor). That beautiful booklet of maps was just so cool! I loved it. Our cars were full of maps and TripTiks. Note: After embarking on our first road trip (30 some odd years ago), I realized that Lori is not a map reader!!!! So I had to either drive dangerously, or stop to look at the map. Arrrghh…. With the advent of Internet-based maps, I stopped going to AAA, or the gas station, for my maps, simply choosing to print the maps out when we decided to go somewhere (enlarge the picture to see how Lori nicely labeled them). And to make sure I knew the surroundings of the area we were visiting, I printed out the surrounding area and streets, just to be safe. 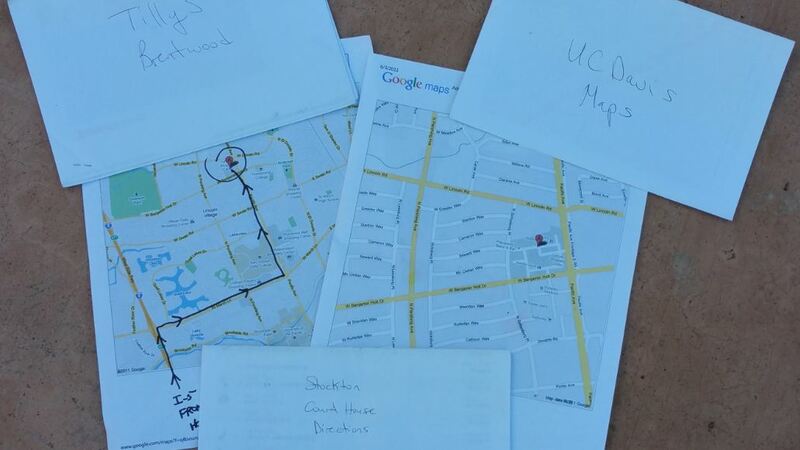 Now, the car was full of printed maps and regular maps….the TripTiks kinda disappeared. But, Lori is still not a map reader. Arrrghh. I had used Google maps previously to get me out of a tight spot, meaning I did not have a printed map for the area I needed to get out of, and I refused to ask. 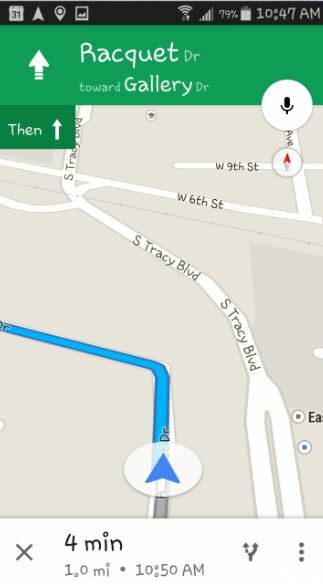 But, this smartphone / Google map experience just was not a great enough for me to completely leave the paper behind. But, I was getting ready…. Slow forwarding into the new world, this month, Jan 2015, I decided to try the marriage of my new Samsung Galaxy Note 4 and Google Maps to guide me to my destination: a house in Mountain House for my friend’s cleaning business (JBB Cleaning Services). 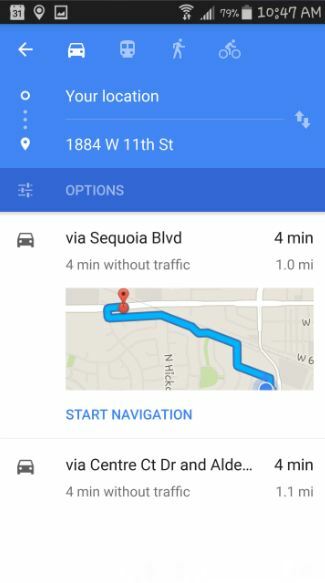 I put the address in Google Maps, hit the buttons as instructed and drove to my destination with the help of my cell phone telling me when to turn. I love it that it also gave me fair warning that a turn is coming up so I could move into the correct lane. I got to the house perfectly. 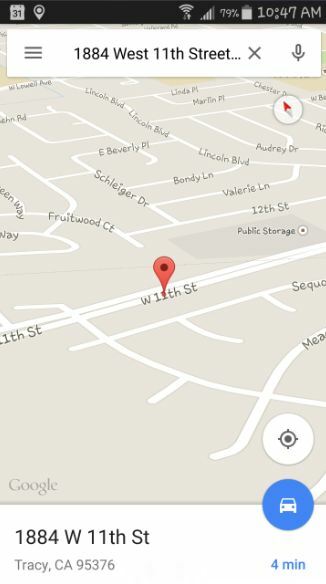 When I was done, I put in my home address and followed the directions back. A different path, but, still perfect. I did not take screen shots of that trip (not expecting to write about it), so here are some screenshots of me going to get my haircut. This stuff is VERY COOL. No more printed maps, no more regular maps (the ones shown were in Lori’s Sequoia, like she can read them anyway…how funny), and, sadly, no more TripTiks. Now it is Just me and my Note 4 and the Internet and the open road with Google Maps leading the way. Lori no longer needs to read a map. Now she tells me to shut the phone up so she can listen to George Strait. Arrrggghh. TechyMike…always the first…..errrr, almost always the first to try new technology. Ask Lori how long it took me to buy a phone with an answering machine, then, for comparison, ask her what she told me when I said (many many years ago) “I want to design an electronic Rolodex” or “Wouldn’t it be cool if I could record a TV show?” or “Doctors can use video conferencing to check in on their patients”.